The Mi'kmaq-Wolastoqey Centre at the University of New Brunswick is hosting its fourth annual Red Shawl Campaign from Oct. 16 to 19 to bring awareness to the issue of missing and murdered Indigenous women in Canada. The campaign was a vision of UNB's Elder-in-residence, Imelda Perley. The red shawl is a symbol of protection; it is what a young girl earns in her footsteps to becoming a woman. When adult women wear shawls, as grandmothers, mothers, sisters and aunts, they embrace the gift of healing. "It is in this healing that we move forward to a platform of justice," says Elder Perley. The Red Shawl Campaign creates a space for action and for healing. It helps persons join together to honour these women and to pay respect to their lives and existence on earth. It provides support and a safe space for families and friends to share and heal. This year, the Red Shawl Campaign welcomes Lisa Meeches, Indigenous advocate, filmmaker and host of the TV show Taken about Canada's Missing and Murdered Indigenous Women. The Red Shawl Campaign has also partnered again this year with the Atlantic Ballet Theatre to bring Ghosts of Violence to the stage. 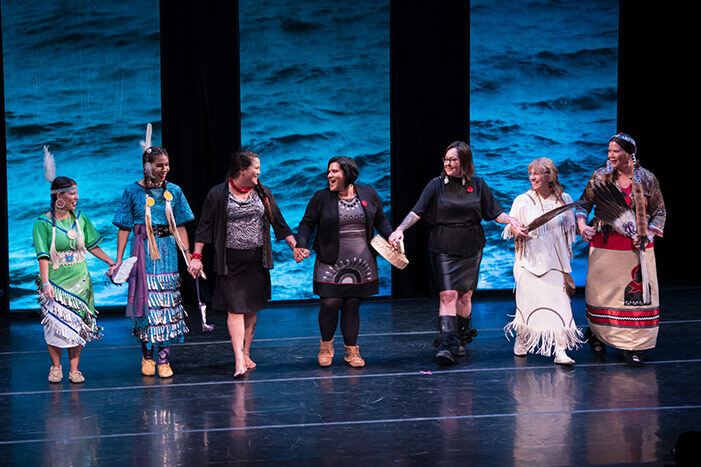 This ballet has been creatively adapted to honour the Indigenous women of the Wabanaki territory - the Mi'kmaq, Wolastoqiyik, and the Passamaquoddy. By weaving dance with Indigenous culture, music and language, Ghosts of Violence has embarked an emotional expression of the Indigenous women we have lost. Ghosts of Violence honouring the Missing and Murdered Indigenous women will be one of several events taking place throughout the week including the Red Shawl Exhibit, an open discussion with Lisa Meeches, a candlelight vigil, and an Academic and Activist Panel.